The introduction of fluorine atoms into organic molecules often alters the latter’s chemical, physical, and biological properties ; and many developed pharmaceuticals and agrochemicals contain at least one fluorine atom. The unique effect of fluorine substitution has intrigued widespread interest and increasing demand for the synthesis of organofluorine compounds. Among various methodologies for incorporating fluorine atoms [2, 3, 4, 5, 6], deoxofluorination plays a significant role and numerous deoxofluorination reagents have been developed [6, 7, 8, 9, 10]. Nowadays, diethylaminosulfur trifluoride (DAST) and bis(2-methoxyethyl)aminosulfur trifluoride (Deoxo-Fluor) are the most widely used sulfur-based deoxofluorination reagents . Compared to their parent gaseous reagent SF4 , DAST and Deoxo-Fluor are liquid, which means that they are easier to operate and more convenient to store. These two deoxofluorination reagents show high reactivity towards alcohols, aldehydes, ketones, and carboxylic acids without pre-activation. Therefore, DAST and Deoxo-Fluor have been widely used in deoxofluorination reactions. However, they are proved to be thermally unstable and highly explosive . To address the safety problem associated with their applications, diethylaminodifluorosulfinium tetrafluoroborate (XtalFluor-E) and morpholinodifluorosulfinium tetrafluorobotate (XtalFluor-M) were developed as crystalline solid reagents, which are more stable and convenient than DAST, Deoxo-Fluor, and other analogues (Fig. 1) . This short review focuses on the use of XtalFluor-E and XtalFluor-M as deoxofluorination reagents. Herein, we give a brief introduction on the synthesis, properties, and C-F bond formation reactions of XtalFluor reagents. Early in 1977, Markovskii and co-workers described that diethylaminosulfur trifluoride (DAST) and the dimethylamino, piperidino, and morpholino analogues all reacts with BF3·Et2O to form the corresponding diakylamniodifluorosulfinium tetrafluoroborates . After that, various dialkylaminodifluorosulfinium salts were prepared [16, 17, 18, 19, 20]. The deoxofluorination capability of these compounds had been neglected for more than three decades. In 2009, Couturier and coworkers modified Markovskii’s original procedures, and synthesized several dialkylaminodifluorosulfinium salts by direct addition of BF3 THF into crude dialkylaminosulfur trifluoride (prepared from N, N-dialkyltrimethylsilylamine and SF4 in dichloromethane) [21, 22]. Crystalline XtalFluor-E can be prepared in the polymorphic form with an isolated yield of 90% (Scheme 1) . An evaluation on their reactivity first demonstrated that both XtalFluor-E and XtalFluor-M can act as efficient deoxofluorination reagents . An assessment on the thermal stability of several deoxofluorination reagents is conducted using differential scanning calorimetry (DSC) analysis (Table 1) . DAST decomposes at 140 °C, releasing 1700 J/g of energy, and Deoxo-Fluor decomposes at 140 °C with 1100 J/g. On the other hand, XtalFluor-E with a melting point of 83–84 °C showed decomposition at 215 °C with a release of 661 J/g, and XtalFluor-M melting at 122–125 °C decomposed at 242 °C with a release of only 388 J/g. These data suggested that the temperatures of reactions using DSAT or Deoxo-Fluor should be carefully controlled in case of explosion. Compared to DSAT and Deoxo-Fluor, XtalFluor-E and XtalFluor-M each having a higher decomposition temperature and a lower exothermic heat generated during decomposition tend to be more stable and safer reagents. However, different from DAST and Deoxo-Fluor, the deoxofluorination with XtalFluor reagents normally requires additional hydrogen fluoride. In the reaction with XtalFluor reagents, tetrafluoroboric acid is released instead of the requisite HF, thus leading to the termination of reaction. To make the reaction successful, an exogenous source of fluoride would be required. In 2009, Couturier and co-workers reported the use of aminodifluorosulfinium tetrafluoroborates as stable and crystalline deoxofluorinating reagents . By adding 3HF·Et3N, deoxofluorination using diethylaminodifluorosulfinium tetrafluoroborate (XtalFluor-E) was found generally applicable to a wide variety of substrates including alcohols, aldehydes, ketones, and carboxylic acids (Scheme 2) . For example, alcohol 5a could be completely converted to the corresponding alkyl fluoride 6a in 85% yield when the reaction was performed in the presence of 3HF·Et3N as a promoter. Another advantage of deoxofluorination with XtaFluors is the reduced formation of the elimination byproducts, as compared with the deoxofluorination with DAST and its analogues. For instance, 4-(tert-butyl)cyclohexan-1-one (5d) reacted with DAST/HF and Deoxo-Fluor/HF produced the olefinic fluoride side product 4-(tert-butyl)-1-fluorocyclohex-1-ene in 33% and 16% yields, respectively, whereas XtalFluor-E exhibited higher selectivity by giving 85% yield of gem-difluoride 6d along with only 4% yield of the olefinic byproduct . Couturier and co-workers showed that in the deoxofluorination of alcohols with XtalFluors, the additive could significantly influence the product distribution . Taking the reaction of hydrocinnamyl alcohol (5a) with XtalFluor-E as an example (Table 2), when no additive was added, a full conversion of alcohol 5a led to a mixture of alkyl fluoride 6a, dialkyl sulfite 7 and dialkyl ether 8; however, a high conversion of alcohol 5a to the corresponding fluoride 6a could be achieved when the reaction was carried out in the presence of 3HF·Et3N (Table 2, entry 3). Interestingly, the pre-mixing of 3HF·Et3N with either alcohol 5a or XtalFluor-E is necessary to achieve a high yield of alkyl fluoride 6a. Most notably, the reaction can be performed in the absence of an additional fluoride source, thus, adding XtalFluor-E to a mixture of alcohol 5a and DBU resulted in an excellent yield of alkyl fluoride 6a, albeit prolonged reaction time was needed. Inspired by Couturier’s work on deoxofluorination of ketones [21, 22], Paquin and co-workers developed the selective eliminative deoxofluorination of cyclohexanone derivatives using XtalFluor-E to synthesize monofluoroalkenes . Through changing the solvent and the equivalents of XtalFluor-E used, conditions favoring the formation of the monofluoroalkenes were found. The reactivity of various cyclohexanone derivatives was evaluated under the optimized conditions (Scheme 3). However, in many cases (10a, 10b, and 10c), the close polarity of monofluoroalkene and the corresponding difluoromethylene side product rendered their separation difficult, and a mixture of the two products was obtained. 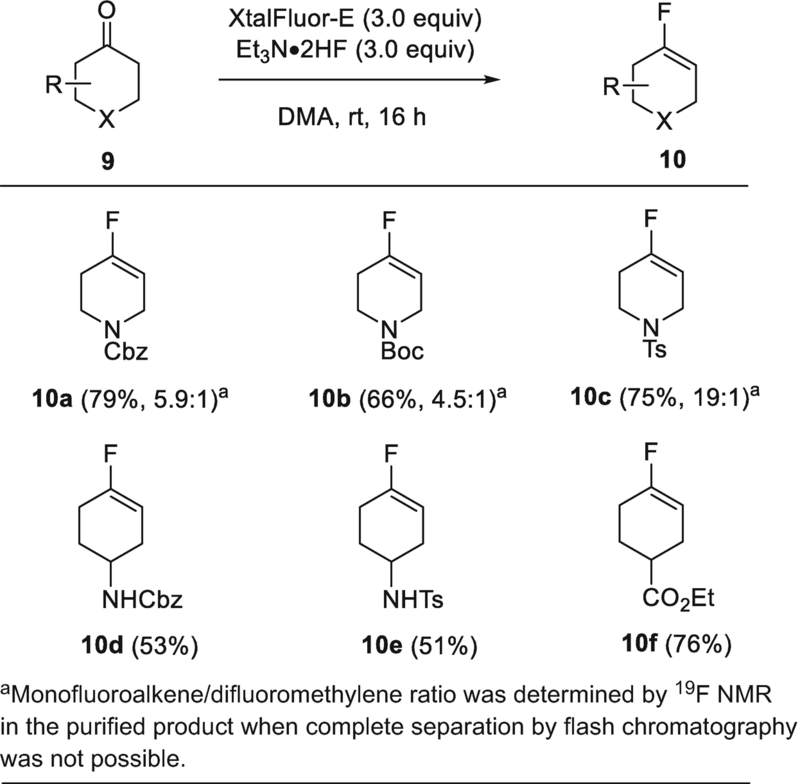 On the other hand, the reaction of cyclohexanones bearing Cbz- and Ts-protected amino groups and ethyl ester substituent provided the corresponding monofluoroalkenes (10d-f) in moderate to good yields without any difluoromethyenes after isolation. 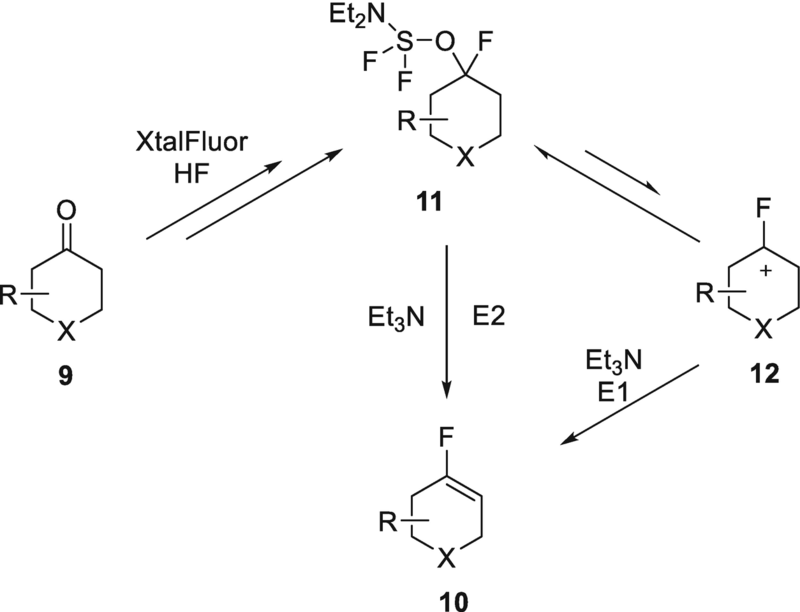 Mechanistically, ketone 9 would first get converted to the intermediate 11, which could undergo two possible reaction pathways to form the monofluoroalkene product 10 (Scheme 4). The first possibility would involve an E2 mechanism triggered by Et3N conducting directly to 10. Alternatively, ionization to carbocation 12 followed by elimination (E1 pathway) would also lead to monofluoroalkene 10 . Since their first development, XtalFluors have found application in the synthesis of complex fluorinated molecules. In 2011, Fuchs and co-workers used XtalFluor-E to prepare a fluorodisaccharide derivative 14 in excellent yield (93%) without side products . However, fluorination of lactol 13 with DAST provided 14 in only 81% yield, and purification with chromatography was required (Scheme 5). 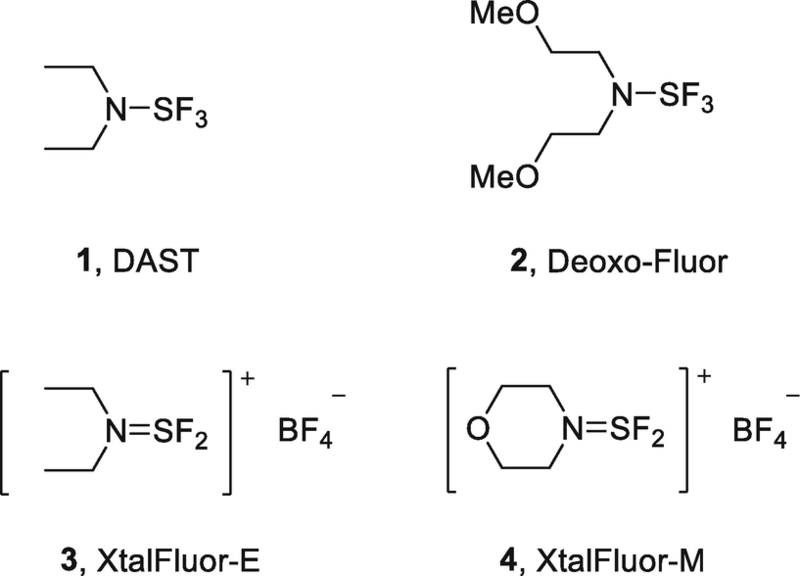 Obviously, fluorination with XtalFluors gives a better selectivity than DAST, thus simplifying the further purification. 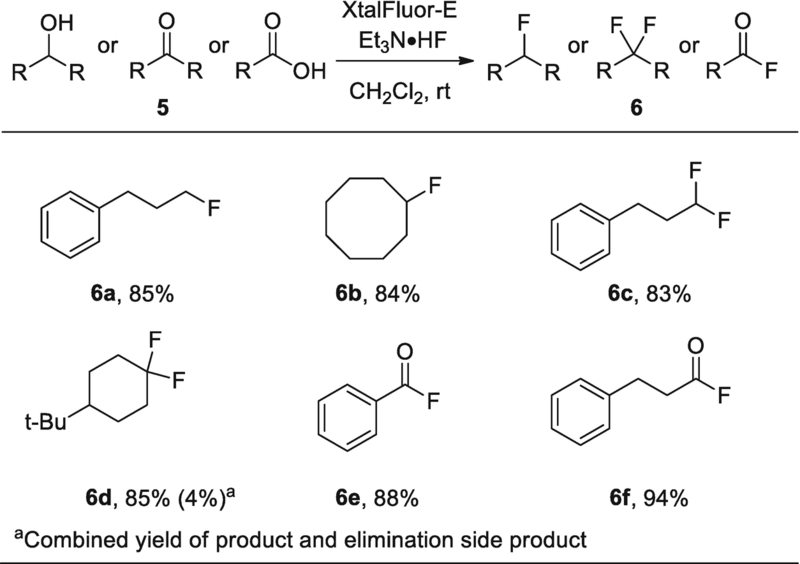 In 2012, Akai and co-workers showed the synthesis of two kinds of fluorinated bridged biphenyls obtained from 3-hydroxyspirodienones by means of XtalFluor-E-promoted rearrangement . 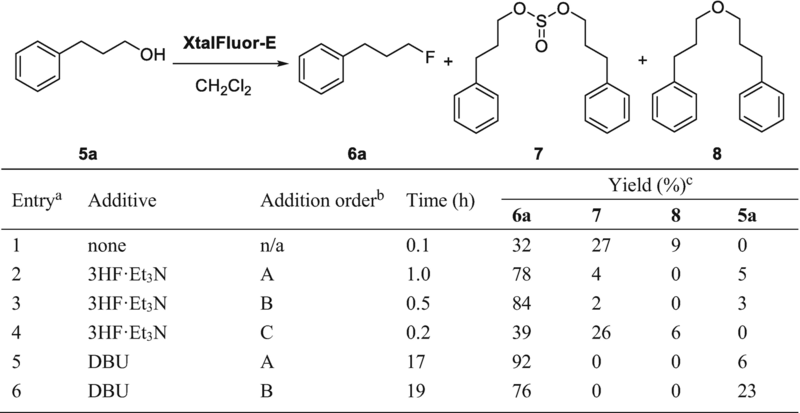 For example, the treatment of spirodienone 15 with 6.0 equiv of XtalFluor-E and 6.0 equiv of Et3N·HF in i-Pr2O-CHCl3 at 50 °C for 1.5 h provided two fluorinated bridged biphenyls 16 and 17 in 74% and 18% yields, respectively (Scheme 6). In conclusion, we showed a brief introduction on the synthesis, properties, and deoxofluorination reactions of dialkylaminodifluorosulfinium tetrafluoroborates (XtalFluors). These new crystalline reagents are more easily handled and significantly more stable than DAST and Deoxo-Fluor. Moreover, fluorination with XtalFluor reagents exhibited greater selectivity by providing less elimination byproduct as compared to DAST and Deoxo-Fluor.